We need to lift our heads up from our phones, say hello, and engage. 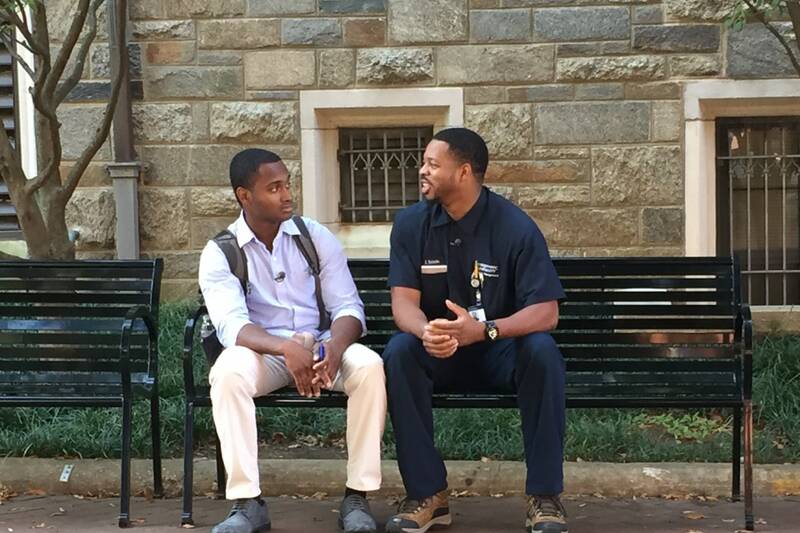 In the October 13th issue of the Washington Post, the story of a Georgetown student and janitor was shared. The student, Febin Bellamy, who had previously felt an imaginary wall between himself and the janitor, engaged in conversation with him and learned his story. After learning the story of this particular janitor, Oneil Batchelor, an immigrant from Jamaica, Bellamy was inspired to learn more about the stories of other workers on his campus. As he got to know more of the workers on his campus, he wanted to create a way to connect students to workers and what began as a class project is now a campus-wide organization. Bellamy began by creating a Facebook page called Unsung Heros, which shared small profiles of workers around his campus. Eventually, these stories inspired students to get involved in supporting the dreams of the workers on their campus and have created successful fundraisers. Batchelor's entrepreneurial dream of owning his own business was made a reality by a fundraiser, which has allowed him to start his own business catering his now-famous jerk chicken. Students also raised money for a cashier at their dining hall to fly round-trip to South Sudan and visit his family that he hasn't seen in 45 years. Unsung Heroes is an inspiring project that should exist on every campus. Each school has hard-working, under-appreciated workers with their own inspiring stories that deserve to be shared. We, as students of these institutions, are fortunate enough to be given the opportunity of higher education and should be grateful to those who enhance the experience for us. As Bellamy explains, "Everybody's in their own world, a lot of students have good hearts and were raised right. It's just not always easy for them to get to know people around them." Most of us were raised with values of appreciating others, but allow this divide to be created between us and our campus workers. So, what can we do about it? We can begin by engaging with those who work across our campus. Instead of staring at our phones as we walk past them in the halls, we can smile and say hi and wish them a good day. I make a conscious effort to engage with custodians on my hall and workers I see daily across campus, even if its just a smile or simple "thank you". We must remember that without these hard-working individuals, our college experience would not be the same. The idea behind Unsung Heroes is one that should exist across all campuses, to appreciate those who are undervalued but deserving of the highest praise. I am proud that my school, The College of Wooster, has started an initiative to grant living and competent wages to these workers called the Living Wage Campaign, but we still need to do more. We need to not just demand adequate wages for our workers, but we need to know them and respect them. So, I challenge everyone to engage with these unsung heroes that exist across their campuses and learn their stories. Even the smallest effort and interaction can make a difference in someone's day, just lift your head up from your phone and say "hi".